Apple has gone all-in on promoting the new Amazon Prime Video app, and is not only telling users that it is available after a tvOS 11.2 update, but has taken out Twitter "promoted" tweets noting it as well. When users install iOS 11.2, they are greeted with a "What's New" screen. The first item on it is a listing for "Amazon Prime Video." The item does not include a shortcut to automatically install the app —but it is the first time that Apple has advertised a third-party service on the update screen. AppleInsider staffers have also seen promoted tweets from Apple accounts heralding the service's availability. It is not clear why Apple is using so many venues to announce the availability of the app. The initiative appears to be Apple's hardest push of a third-party app or product it has ever undertaken. It is possible that the ads and the inclusion on the splash screen are related to a possible future restoration of the Apple TV on the Amazon marketplace. As of Friday morning, the Apple TV in all its forms remains unavailable after its withdrawal over two years ago. 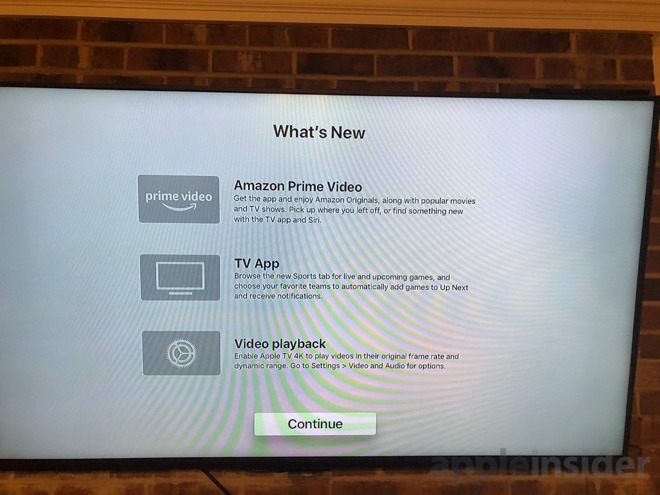 Amazon withdrew the Apple TV and Chromecast on Oct. 29, 2015, after it claimed that Amazon Prime Video compatibility was necessary for the company to sell set-top boxes to avoid "customer confusion." Amazon could have made that happen at that time with a channel in the third-generation device or an app for the fourth-generation as it now has —but at the time it chose to not do so. In May 2016, Amazon CEO Jeff Bezos suggested Prime Video would remain off devices made by Apple or any other company marketing comparable set-top streaming products until amicable reimbursement models are agreed upon. Presumably, Bezos didn't want to shell out 30 percent to Apple for content it delivers and sometimes generates itself. Apple CEO Tim Cook announced at the WWDC that Amazon's video streaming service would be available on the Apple TV in 2017. The app has not as of yet materialized, but an unconfirmed rumor suggested that it could have happened on Sept. 28 in conjunction with a Football game between the Chicago Bears and the Green Bay Packers that Amazon streamed. While the app is functional and streams 4K HDR video when available, it does not at present support Dolby Vision, and it is also not currently providing 5.1 audio, despite advertising that it does.